San Juan Paradise: A trip down this Utah river is a lesson in living history. It doesn't dawn on me that it is Sunday. 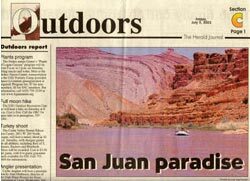 I know only because Charlie DeLorme, owner of Wild Rivers Expeditions, mentions it as we prepare to launch our boats at Sand Island near Bluff in Southeastern Utah, the most popular launch site for San Juan river runners. Already time has started to blend into itself, everyday outside is sacred. Once upon a time I remember wrestling my dads external-frame army pack from the garage. I recall the big one-size-fits-all flannel sleeping bag that when rolled up was only slightly smaller than a bear. And the technical hiking boot was more along the lines of a Converse high-top. Well, we've come a long way baby and this ain't your daddy's gear. 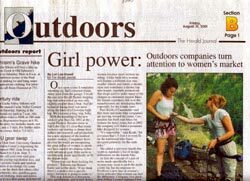 With the unveiling of the new outdoor gear lines for 2002 it's clear that manufacturers are starting to dump their dollars into research and production for a new segment of the outdoor market: women. Outdoor gear companies from all over the world, from socks to bikes, are recognizing the great in-flux of women in sports and have started developing technically advanced gear made specifically to fit the female body. "Women are out there looking for product," says Bonnie Eadie of Salomon. "If we think there's a market, Salomon is going to make it." This year Salomon has researched and designed skis, snowboards, and in-line skates made specifically for the female athlete. In January of 2002, for example, Salomon will release its first high performance-level in-line skate made specifically for the female. "To glance at a skate made for men and one made for women you can't see much of a difference, but the skate height has been adjusted to better fit the smaller female calf and the foot bed runs narrower and with a bit more arch," explains Eadie. Quinton Appedaile, previous cycling shop manager for Al's Sporting Goods, says more companies are making bikes specifically for women because more women are riding. Snow Go – Winter's Most Affordable Sport: Snowshoeing offers the tranquility of being outside in the winter without a big price tag. Winter sports carry a price tag. According to the Snowsports Industries of America the average price of an Alpine ski set up is $718.55, while for a snowboard, bindings and boots you'll look to spend $518.70. And don't forget the price of the lift ticket. If the price of winter recreation has kept you indoors, despair no longer, winter's most affordable sport is gaining popularity. Snowshoeing has been around for hundreds of years but it's no longer the old wooden waffle shoe from days of yore. 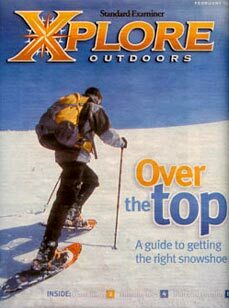 Today technological innovations have revitalized the sport until we now see snowshoe race teams, adventure races that include snowshoeing, and general participation climbing the charts. According to Snowsport Industries America, more than one million people snowshoe regularly, and 40% of snowshoers are women. "I started snowshoeing when I was seven," says Kathy Murphy, General Manager of Tubbs Snowshoes. "It was important to my parents that we were outdoor enthusiasts and my first snowshoes were 8"x 40" wood shoes with a tail. It was cumbersome, and heavy," she explains. She didn't get her first pair of aluminum snowshoes until 1980. "The opportunity to be outdoors enjoying the silence and serenity of winter has always been important to me. Now today, 40 years later I still love to snowshoe." Snowshoe companies like Atlas, Mountain Safety Research (MSR), and Tubbs have all developed snowshoes specifically for women. Karen Righthand of Atlas Snowshoe Company explains, "We spent two years making just the right shape for our women's shoe. It has all the same features as the men's, but it has a different geometry. It has a tight top radius that creates a sleek profile and allows women to stand in their natural stride." She points out that this makes walking more efficient resulting in less muscle fatigue.